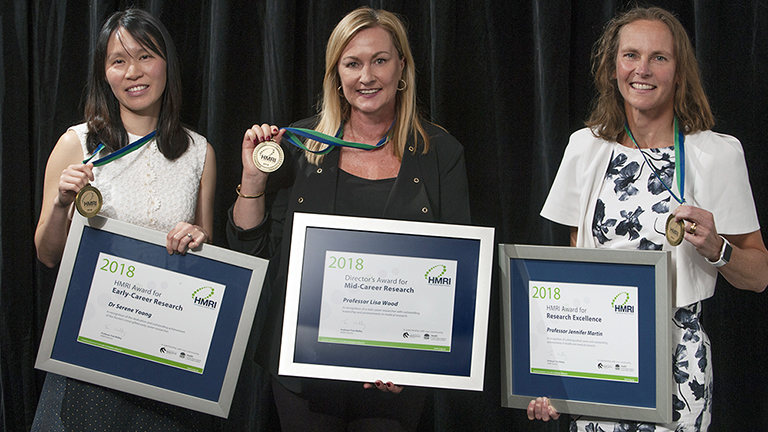 Young researchers scooped the pool at the 2018 HMRI Awards Night as more than 30 new grants exceeding $1 million in total, along with three major annual awards, were announced for vital health and medical research projects. HMRI Award for Early-Career Research recipient Dr Serene Yoong, Professor Lisa Wood – recipient of the HMRI Director’s Award for Mid-Career Research and Professor Jennifer Martin – winner of the prestigious HMRI Award For Research Excellence. It’s a record tally in the award’s 20-year history, with early and mid-career researchers receiving up to $100,000 to seed-fund their projects across a raft of disease areas. A further 56 previously-awarded grants and scholarships collectively worth almost $10 million were also recognised during the event. HMRI Director Professor Tom Walley said that this year’s funding was intentionally targeted at those researchers within 15 years post-PhD to encourage them to continue working in the region. “A particular passion of mine is supporting early- and mid-career researchers, the custodians of our future health outcomes, so I’m delighted that this year’s Awards have focused on this very important group,” Professor Walley said. The HMRI Award for Early-Career Research went to Dr Serene Yoong, a behavioural scientist and dietitian renowned for her work in disease prevention. As an example, an online menu-planning program that Dr Yoong initiated has helped childcare providers offer healthier food to more than 200,000 young children across Australia. Professor Lisa Wood received the HMRI Director’s Award for Mid-Career Research for leading the way in using nutritional approaches to manage airway inflammation in respiratory illnesses, particularly the roles played by antioxidants, fatty acids, fibre and obesity. In the major announcement of the night, dual-trained clinical pharmacologist and general physician Professor Jennifer Martin won the prestigious HMRI Award For Research Excellence. Professor Martin has a distinguished research record in drug dosing, drug discovery and drug repurposing – particularly in cardiovascular disease, cancer and medicinal cannabis. She is Chair of Clinical Pharmacology at the University of Newcastle (UON) and Senior Staff Specialist at John Hunter Hospital, while directing the Australian Centre for Cannabinoid Clinical and Research Excellence based at HMRI and the University of Newcastle. With funding coming from over 11,000 individual donations in the past year, ranging upwards from $2, Professor Walley added that the community was the beating heart of HMRI.